The MCP2221A is a USB-to-UART/I2C serial converter which enables USB connectivity in applications that have a UART and I2C interfaces. The device reduces external components by integrating the USB termination resistors and the oscillator needed for USB operation. The MCP2221A also has four GP pins providing miscellaneous functionalities (GPIO, USBCFG, SSPND, Clock Output, ADC, DAC, interrupt detector). 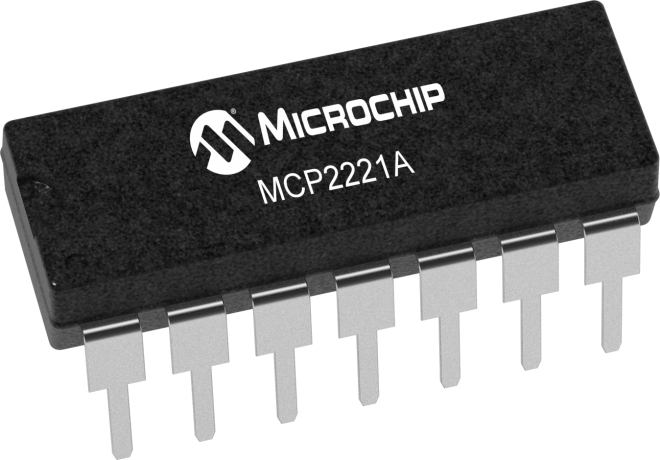 The MCP2221A is identical to the MCP2221 in all aspects except for the maximum supported baud rate of the UART, which has been increased from 115200 (MCP2221) to 460800 (MCP2221A). All MCP2221 USB Drivers and Software can be used for the MCP2221A. Human Interface Device (HID) for both I2C™ communication and control. The MCP2221 I2C Demonstration Board allows the user to communicate through a PC application to I2C slave devices by using the MCP2221 device as USB-to-I2C Master converter (bridge). The board can also work at the same time as a USB-to-RS232 (UART) bridge. The MCP1663 USB programmable power supply reference design was developed to provide a versatile and easy to use solution for engineers. It easily transforms a typical computer’s USB port into a variable output power supply capable of supplying 2.5V to 30V.